On "Super Tuesday" February 5, 2008, after the disappointing (third place) primary vote tallies in Florida -- the home of hundreds of thousands of prior New Yorkers -- Rudy Giuliani announced the following day that he was withdrawing from the presidential race and endorsing Senator John McCain. 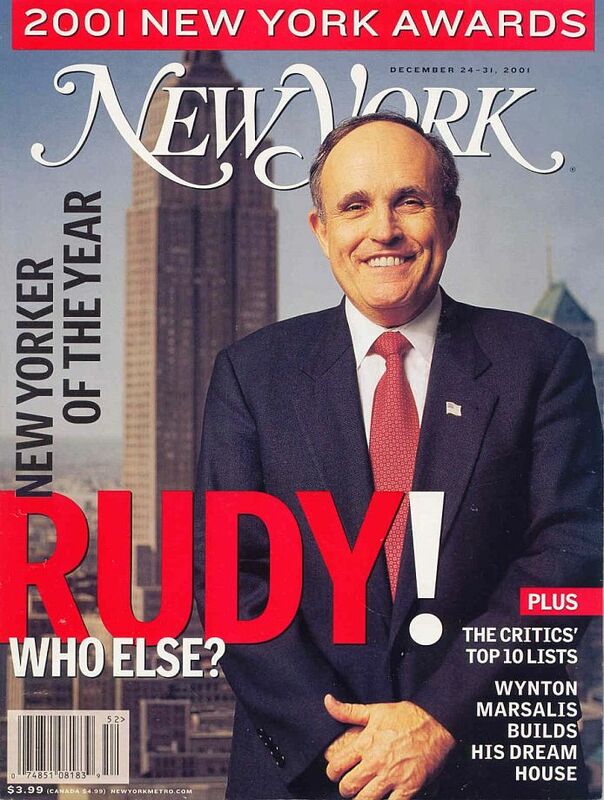 Rudy had been undisputedly in first place in all of the national polls. His New York-based, credible, high-profile and popular candidacy spoke volumes as to the significance of the great City of New York. How many city mayors are ever in a position to run for the president of the United States of America? Previously, Mayor John Lindsay was a Republican-turned-Democrat presidential candidate in 1972. 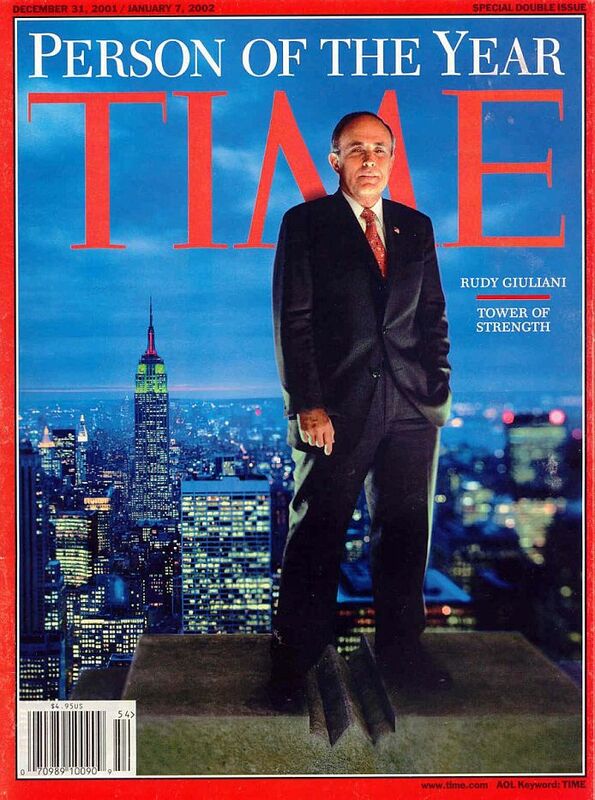 Congratulations to Rudy Giuliani -- you served us proud once again -- America's Mayor! In New York City onthe 5th of February 2007, Brooklyn-born "America's Mayor" Rudolph W. "Rudy" Giuliani ("RWG") announced that he took the next step -- Federal filing of official intent -- to his 2008 candidacy to be the President of the U.S.A.! On Thursday, February 15th, RWG confirmed that he is, in fact, a presidential candidate! By the end of that month, even Timemagazine called the S.V.A. about Rudy! 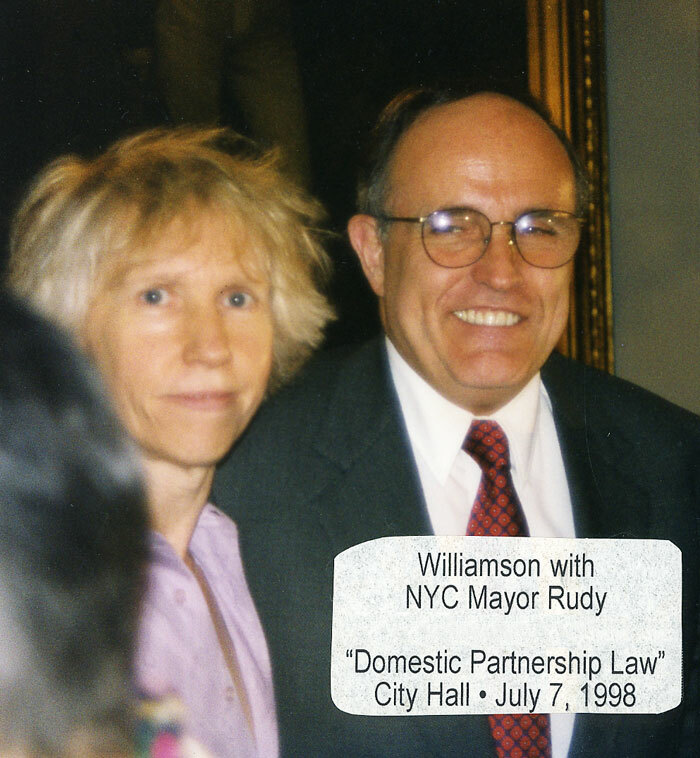 Particularly during the month of March while campaigning throughout America, Mayor Rudy restated again (and again) his democratic (with a small "d") support for the rights of all American citizens, i.e., Gay people, and for Gay couple civil unions. It was less than three months before the unknowing and horrific September 11th, 2001, terrorist attacks (that's two) on New York City, that N.Y.C. 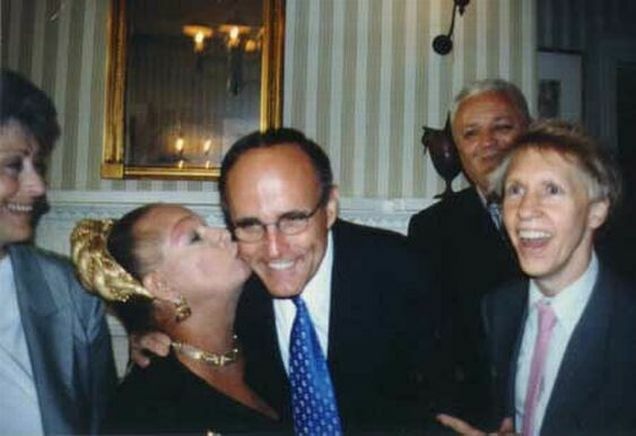 Mayor Rudy Giuliani hosted his "8th Annual Gay Pride Celebration" at Gracie Mansion in Manhattan, New York. It was held on Thursday, June 21, 2001, and for the first time, at the perennial urging of S.V.A. President Williamson Henderson, and a few others, it was held not as an early morning breakfast but as an evening cocktail party. 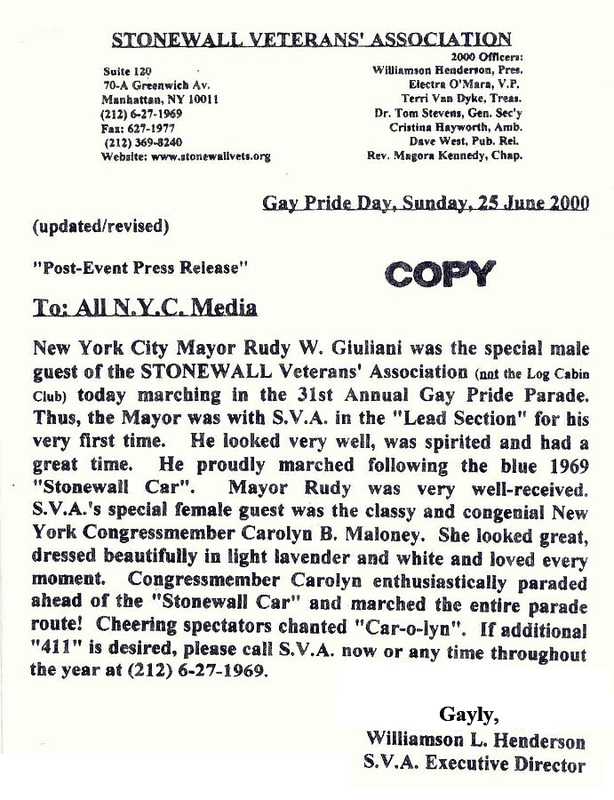 On Sunday, June 24, 2001, Mayor Rudy Giuliani -- and his new and unusual political buddy, Michael Reubens Bloomberg, successor Republican candidate for New York City Mayor -- joined the STONEWALL Veterans' Association ("S.V.A.") and the 1969 blue Cadillac "Stonewall Car" in leading the annual New York City Gay Pride Parade down Fifth Avenue in Manhattan. Of course, Mayor Rudy's office called to get the green light that the S.V.A. would have this highly successful media magnate, Mr. Bloomberg, who we did not know personally but only knew of, also as our special guest. Mayor Rudy's communications director made it clear that the Mayor was asking this favor and that he hoped that the S.V.A. -- of which he was and is an Honorary Member -- trusted his judgment in this as we have in many other matters. Guess what? 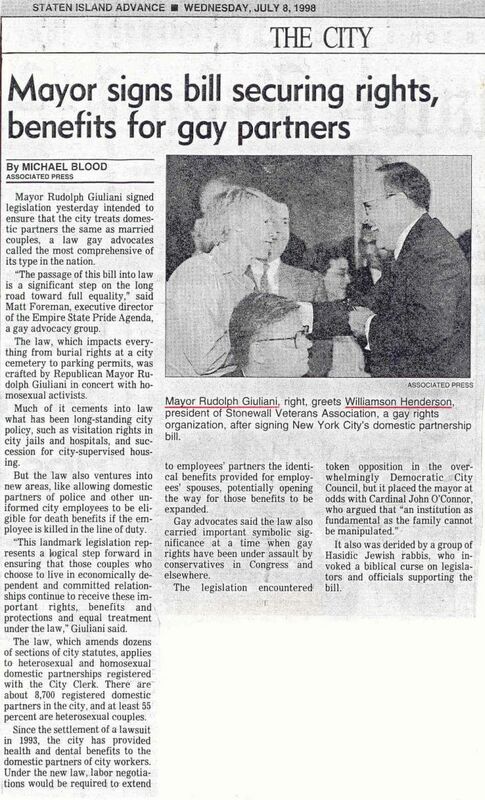 In fact, Mayor Rudy personally introduced mayoral candidate Michael to the S.V.A. President Williamson and other S.V.A. officers such as Jeremiah Newton, Leigh McManus, Cristina Hayworth, Terri Van Dyke, Electra O'Mara and Dave West. Williamson and Michael Bloomberg hit it off immediately regarding "Stonewall" right in the middle of the Fifth Avenue! Right was Rudy!! After all was said and done -- and plenty was done and said -- after being endorsed by and promoted by Rudy, media magnate Michael became the next N.Y.C. Mayor! letter was selected as one of "S.V.A. 's Top 5 Best Letters". 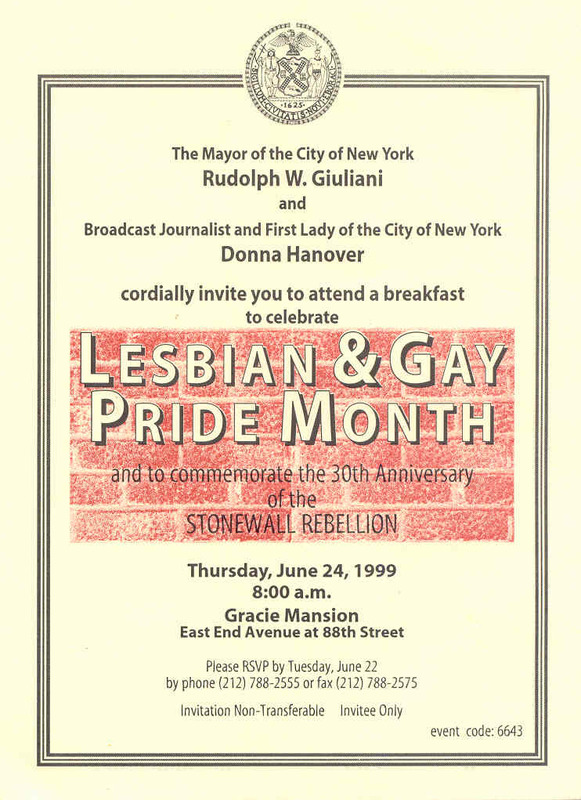 Pictured above on the front cover of the Summer of 2000 issue of the STONEWALL Newzletta are (l-2-r): STONEWALL Veterans' Association officers Terri Van Dyke (Treasurer), Williamson Henderson (President) and Cristina Hayworth (Ambassadress) with host Mayor Rudy Giuliani at fabled Gracie Mansion for the annual N.Y.C. GayPride Celebration. For those Americans nationwide and non-American citizens worldwide who may not know, this is a tradition for New York City Mayors started by the internationally-known NYC Mayor Ed Koch. Many NYC public officials such as the borough president, the comptroller and the public advocatesponsor their own diverse Gay Pride celebrations. 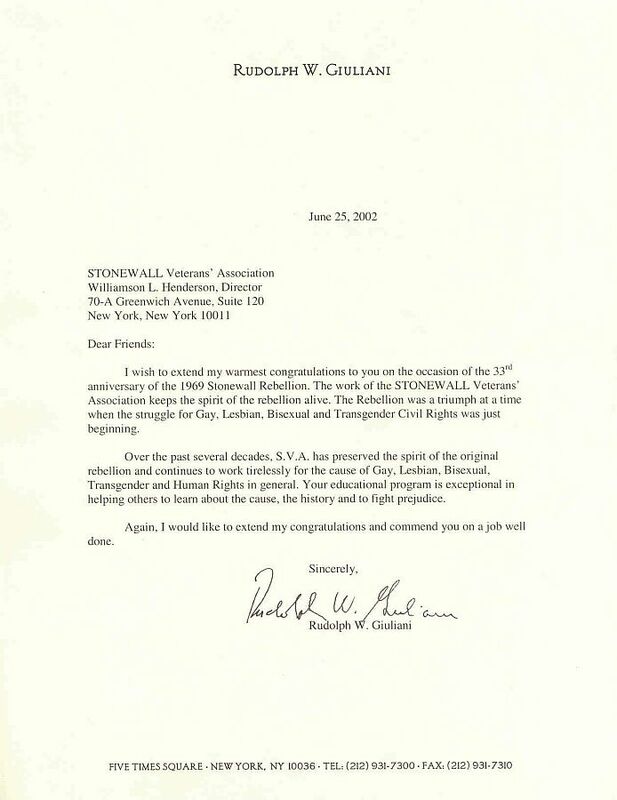 Our organization, the national STONEWALL Veterans' Association received Gay Pride letters of congratulations and praise from U.S. Senator Daniel Moynihan (D), Senator Alphonse D'Amato (R) and N.Y.S. Governor George E. Pataki (R) among dozens of other prominent public officals. proudly printed it on the inside cover of a Sunday edition! 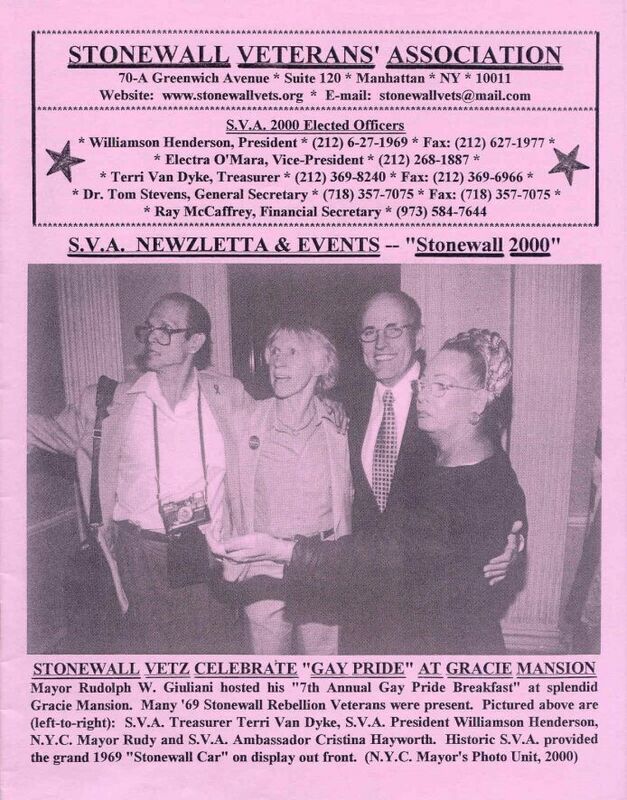 Thursday, June 24, 1999 -- Happily pictured above are the STONEWALL Veterans' Association ("S.V.A.") Ambassadress Cristina Hayworth, up from Puerto Rico, with a Cuban cigar gift for the Mayor (which the honorable mayor had to "by City law" refuse) and bussing a very amused and fun-filled New York City Mayor Rudy W. Giuliani. The S.V.A. President Williamson Henderson is laughing big time and, in the rear, S.V.A. Vice-President Jeremiah Newton is beaming. Literally to the far left is former Corresponding Secretary Harriet "Mo" Garblestein. 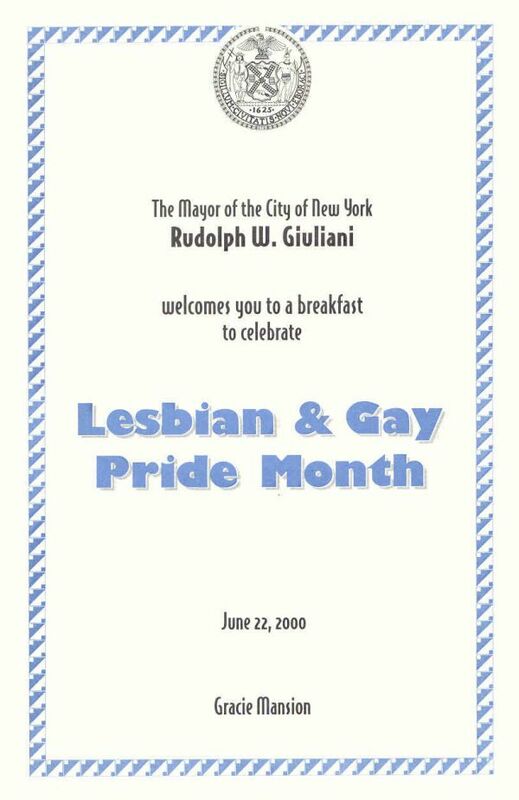 The Mayor was with the S.V.A just three days later leading the annual New York City Gay Pride Parade down famous Fifth Avenue for most of the parade route. When Mayor Rudy used to (past tense) march with the Log Cabin Republican boys, the Mayor unfairly (due to association) got many boos and hisses from the parade spectators. In sharp contrast, whenever Rudy marched with the S.V.A. Stonewall veterans and the famous, blue, classic Cadillac convertible "Stonewall Car", he received overwhelming cheers and kisses from the crowds!! And, so Mayor Rudy gladly observed and verbally commented on the very welcomed change! The Stonewall Veterans with the Mayor were filmed by all of the television stations and photographed by all of the print press. The SVA's Williamson Henderson gives friend N.Y.C. Mayor Rudy Giuliani a big, hearty laugh. Standing proudly behind Williamson is openly-straight, Republican N.Y.C. Councilman Andrew Eristoff. Sitting detached from the happiness around him and looking glum is openly-Gay, Democrat N.Y.C. Councilmember Tom Duane (aka "Duanda"). All of the local television stations covered the historic event. 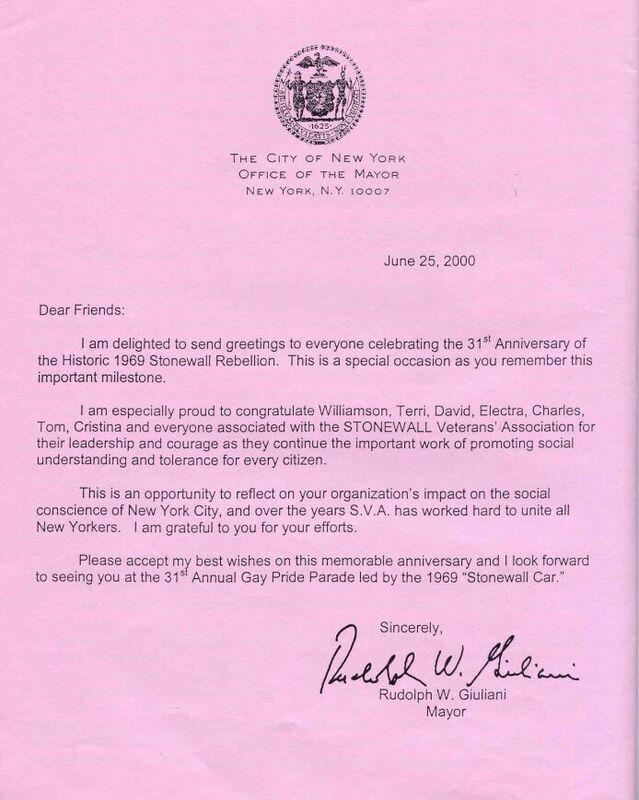 Mayor Rudy Giuliani's Annual Ace Letter to S.V.A. 17th Anniversary of the four (4) cowardly, radical, Islamic, terrorist, sneak attacks against America in Washington, DC, Shanksville, PA, and New York City, NY (twice at the World Trade Center towers) when Rudy Giuliani was the outstanding NYC mayor! 15th Anniversary of the September 11th, 2001 Attacks on America!. Mayor Rudy W. Giuliani's September 11th tribute in N.Y.C., regarding the four terrorist attacks in 2001, was held at the site of the new World Trade Center including the 1,776-foot high Freedom Tower in New York City, America! at Temple Emanu-El in Manhattan, NY.